HB Series band heaters are used to heat the barrels and nozzles of plastic injection molders and extruders. 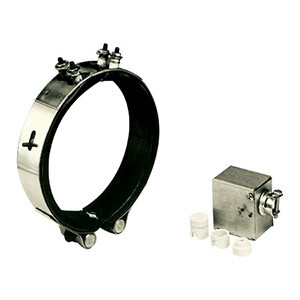 They are also used on autoclaves and for heat treating large diameter piping. Heater elements are high temperature, tight fitting, and provide uniform heat distribution. These elements are made from a pair of formed OMEGALUX™ PT series 240V mineral insulated strip heaters with chrome steel sheath. Complete firm coverage at all times is assured by slip proof, stainless steel clamping bands equipped with heavy threaded socket bolt; this allows the pair of elements to be drawn tight to heated surface. The hotter it gets the tighter it fits. Because clamps cannot loosen or slip off heater, heat transfer is continuously efficient, adding to heater life. Adjacent HB Series heaters of equal wattage may be wired in series on 480V or connected in multiples of three of 240 or 480V, 3 phase.